That cross hatching quilt is still not done! So much for wanting to finish it that day! It really is a lot harder than I thought! The hatching is all done, it's just the baskets that I have no clue what to do in them. The inspiration will come! You know, machine quilting inspiration and/or determining the quilting designs is what I find the hardest. I just do not spend enough time with Penelope to have it come to me naturally. Sigh...! On the quilting front, I've been a busy bee! I recently finished this little gem! 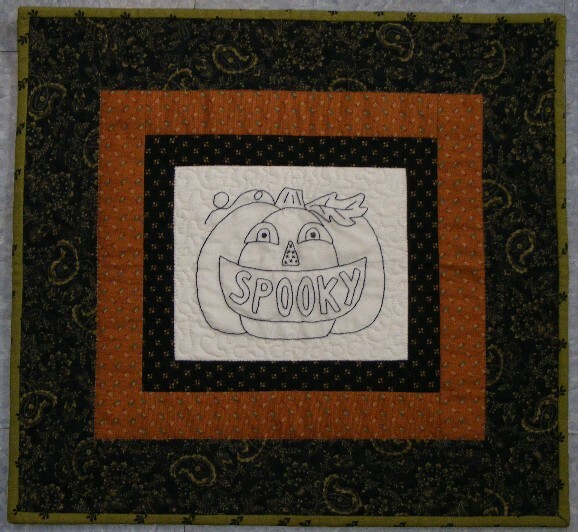 This is a pattern is called Smiling Spooky by Stacy West of Buttermilk Basin! Her patterns are just so adorable! Love her primitive style! I used reproduction fabrics with Jan Patek's Blessing line. I love that poison green! I have another one to show you! But first, I must machine quilt it! Thanks for stopping by! Off to do a bit of quilting! What an adorable jack-o-lantern! You did a great job on this - you can't help but smile when you look at him! Love it, Carole. How appropriate for the season! Love the piece. I will finish mine today. 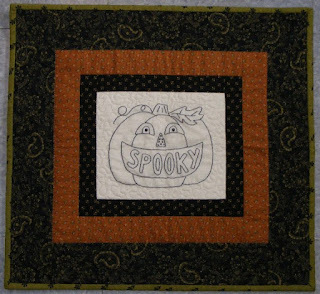 I have been doing more stitchery, it is relaxing to work on at night and then I can make them into mini quilts. I usually hand stitch mine, not that great at machine quilting yet, but need to practice more. I saw you post on the finger tips, I need those, so will look for them. I push the eye in one finger and the tip in the other, and it does get sore. LOve, love this cute pumpkin face! Halloween is fun!! Hocus Pocus .... Happy Halloween....!